Will any of the 24 Vulcans that Aston is building work hard? Unlikely. Certainly none of them will be as abused as the development motor that did over 10,000km testing around Nardo’s in-field circuit. That’s flat-out Darren Turner kilometres, too. 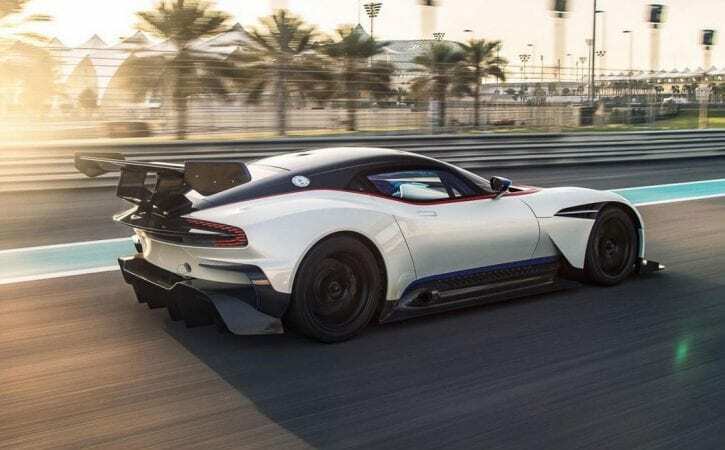 Aston reckons the Vulcan now has the outright lap record there, posting a 2min 07sec lap time, which Aston says is nine seconds faster than a McLaren P1 road car. So yeah, it’s pretty fast. The first time it ever ran in anger, straight off the truck at Snetterton, the Vulcan was three seconds per lap faster than Aston’s GT3 racer. That may not sound that much considering the power advantage, but there’s still a gulf in set-up between a real racing car and the Vulcan. To drive, Yas Marina isn’t a sensation, mostly made up of tight 90s, but it has one or two ballsy corners – turn three is fast and cresting, and the double apex third gear right that brings you face on to the hotel is a decent challenge, trusting the grip and balance as you back the power off mid-corner. In both turns you really feel the downforce pressing the car into the tarmac. Anyway, the backdrop and setting is what sets Yas Marina apart. The hotel, the people on bridges, the boats in the marina, the vast grandstands, the sheer inclusiveness of racing in semi-urban surroundings. You’re on display, an actor on a stage. It’s a kind of motorsport utopia. Middle Eastern Monaco. It’s got a tunnel as well as those yachts. That there are no noise restrictions – none – during running hours that can extend beyond midnight, is something that makes it genuinely unique. Before I went out to Abu Dhabi, I went to have a go on the Vulcan simulator. Aston suggest that all owners do this to prepare themselves for the car, so that when they get to a particular track, they can hit the ground running. The sim isn’t Aston’s own, but belongs to Base Performance, which is owned by Aston pro driver Darren Turner. The graphics aren’t sensational in terms of pixels, but they are spot on in terms of track accuracy. Sat inside the shell of a GT3 car, digital images fill your entire vision, and when you start to drive you forget all about everything bar the driving, you become immersed. And you can learn quickly. There’s no jeopardy involved for driver or instructor and at any second Darren can just press pause, the world stops turning, and he can give you a few pointers about your current position on the track, your approach to the next corner etc. When he does so, you realize just how immersed you were in what was going on, and although the world has stopped turning, your brain hasn’t. It’s easy to get dizzy. Darren reckons that it’s mentally more tiring on the sim than in the real word as your brain is having to gap-fill for the information it’s not receiving – actual physical sensations. As part of the driver training when you get out to a circuit, Aston aims to lay on other cars for you to drive. So you start in a V12 Vantage, just to learn the lines around the circuit. Then you move on to a slick-shod Vantage GT4 racer to discover the difference that slick tyres make. The final step is to try a One-77 to get you used to the power levels of the Vulcan. Then you put all this, and your simulator knowledge together, hop in your Vulcan and go for it. However, even then you might no want to start with the power knob twisted straight round to 820bhp. It’s wise to build back up by starting in 550bhp mode, discovering just how much of a kick acceleration receives when you go to 675bhp, and finally taking some brave pills and going for 820bhp. In the future all cars might have a system like this. The Vulcan is the first car in the world to use a canister oil system developed by Castrol, called Nexcel. Instead of just pouring oil into the top of the engine, and when it needs changing, draining it out the bottom, you simply have a canister about the size of a car battery which acts as reservoir and filter. When the oil needs changing you simply lift it out and put another one in. However, don’t dismiss the Cup 2. Around Nardo it was only four seconds per lap slower than the racing slick and Aston couldn’t believe how well it coped with the forces the Vulcan delivers. Having used it for a lot of the driving shots you see here, I can only agree. The way it hangs on is remarkable and wear rates were very low. They look very cool and are very simple to make, according to Aston’s chief designer, Marek Reichmann. At the end of each lollypop is a simple, controllable LED light. I wouldn’t put it past Aston to use this technology elsewhere in future. Although possibly in a format that is easier to keep clean. One of the few optional extras you can choose for your Vulcan is a carbon panel set. It costs £16,000, and includes these awesome strakes for the venting panel behind the front wheel, plus badges and interior air vent surrounds. Apparently they all come from the supplier in a special presentation case, but what I really liked was the finish on them – it’s machined carbon, trimmed and sculpted from a block, which gives it this almost wood-like look and texture. Very cool indeed. It was late at night, we’d just finished doing some cornering and were heading back to the pits to regroup. Photographer Richard Pardon and I were in the Vulcan discussing how cool the view from my eyeline was. The end result of this was him rigging the camera up where my head should be and me having to cant my head and body out the way, and look through the gap between rollcage and A-pillar for the length of the main straight. Open the Aston’s engine bay (it has neat latches tucked into those vents either side and rises on gas struts) and have a look at the carbon. There’s a lot of it. Now see how the inlet pipes and engine cover make the thing look like a spatch-cocked oven-ready chicken. They really do. Partly this is because they’re wrapped in the finest heat-reflective material known to man – gold – which aims to keep the heat within the titanium tubing. Inflict 820bhp on the exhausts and after a full bore lap or two, the exhausts glow with the heat. Helps with the flames, too. I can’t tell you how much of a relief this was at Abu Dhabi, even running at night. There’s a two stage fan, and the fan appears to run direct from the V12. It’s POWERFUL. Darren Turner also insisted on vents under the steering wheel pointing at the driver’s, er… tenders. He refers to this as the BCD. If the last two stand for Cooling Device, I’m sure you can work out the first.